Take 1 capsule once a day, preferably during a meal. Recommended by the manufacturer 1 capsule a day is optimal and completely sufficient dose to support the body's functioning. Due to the fact that it is a fat-soluble vitamin, it is best to take it in the before the meal which contains fats. 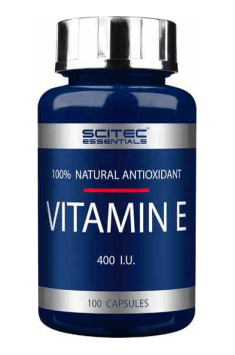 The synergistic activity of vitamin E with other antioxidants (vitamin C, alpha-lipoic acid), sesamin and coenzyme Q10 has been observed. Vitamin E increases the effect of coumarin-based anticoagulants (for example Warfarin). Therefore, the supplementation of vitamin E together with medicines from this group may increase the risk of bleeding. Capsules containing vitamin D-3 and K-2. They strengthen bones and teeth, and calcium absorption. Dietary supplement improving mood. Accelerates the regeneration, helps you fall asleep and relaxes. Organic Chaga mushroom powder. Stimulates the immune system, improves physical endurance. Dietary supplement containing chromium. It supports metabolism and regulates the level of glucose in the blood.